Kitchen Cabinet Makeover -One Room Challenge Week Five: The cabinets are finished and look amazing painted white with antique brass knobs. 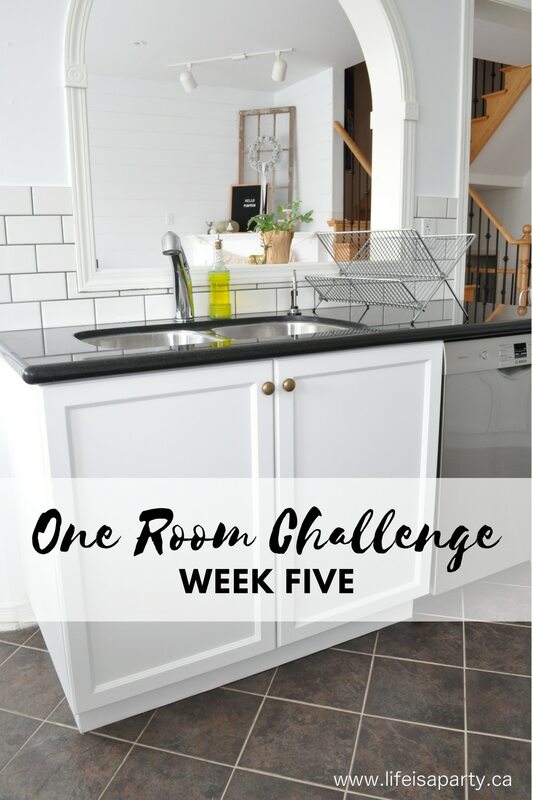 I’m five weeks into a seven week kitchen makeover for the One Room Challenge. The ORC is a hosted by Calling It Home, and over 200 guest participants share their progress each week. Be sure to go and check out their progress too. And if you missed any of my updates you can catch up by clicking below. I have been working with a great local company –Smith Sprayers to have the kitchen cabinets painted. Ever since we moved into this house over 10 years ago I’ve been dreaming about a white kitchen. This kitchen came with maple cabinets. I didn’t hate them, but I certainly never loved them. And right from the beginning I knew I’d love to replace them with white someday. “Someday” has finally arrived, thanks to Smith Sprayers. I knew I couldn’t afford to replace my kitchen cabinets, and they were in great shape. I really just didn’t like the colour of them. Over the years I considered a few options on how I might change them to white without the expense and mess of replacing them completely. I was afraid to paint them myself. My worry was that if they were painted they would eventually chip and look worse than the plain maple cabinets I wanted to replace. I also looked into having them re-faced -where you have the doors replaced, and there is a laminate sticker type product applied to the cabinet bases. It was shockingly expensive -to the tune of over $8000 for my small kitchen. My husband suggested having them professionally painted. 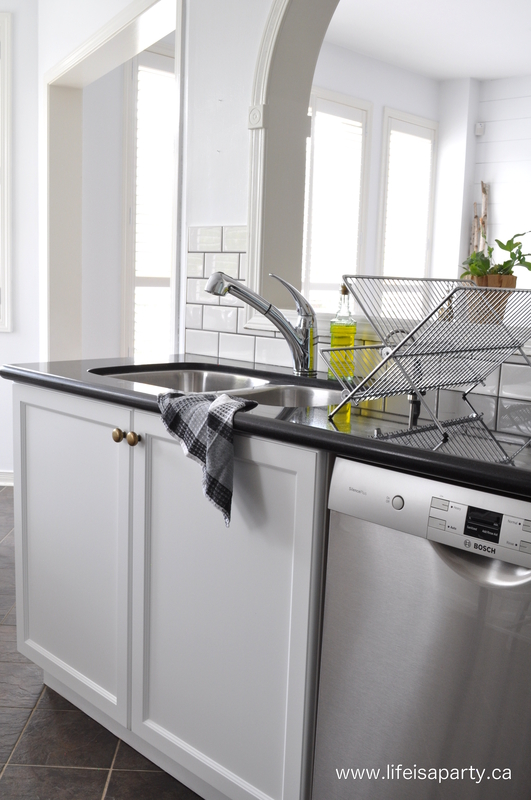 I’m all for DIY and tried to do a lot of it with this kitchen makeover. I wasn’t keen on painting my own kitchen cabinets for fear of the quality of the paint adherence and any drip marks and paint build up in all the corners and ridges. My husband had a friend who used Smith Sprayers and recommended them to us. I wasn’t too sure, but thought we should meet with them for a quote. As soon as Cindy arrived in my home for the quote I liked her. She was friendly, courteous, and really knowledgable. She explained to me that they would apply two paper-thin coats of primer to everything, and then 4-6 more coats of paint on the bases of the cabinets. The doors and drawer fronts would be removed and sprayed in the shop for a perfect finish. She said that the paint she used would not chip, and in fact should easily look great for 10 years of normal wear and tear. She also said that she stands behind her work, and would visit a month after installation to ensure I was happy, and would be available in the future for touch ups if there were any problems. I was sold. For a fraction of the price of replacing them, Smith sprayers did a beautiful job painting my kitchen cupboards. Cindy worked with me to pick out the perfect colour to complement the existing wall colour and new tile. I really appreciated her artist’s eye when it came time to choosing colours. On their first visit they removed the cupboard doors, and took them back to their shop to work on them. 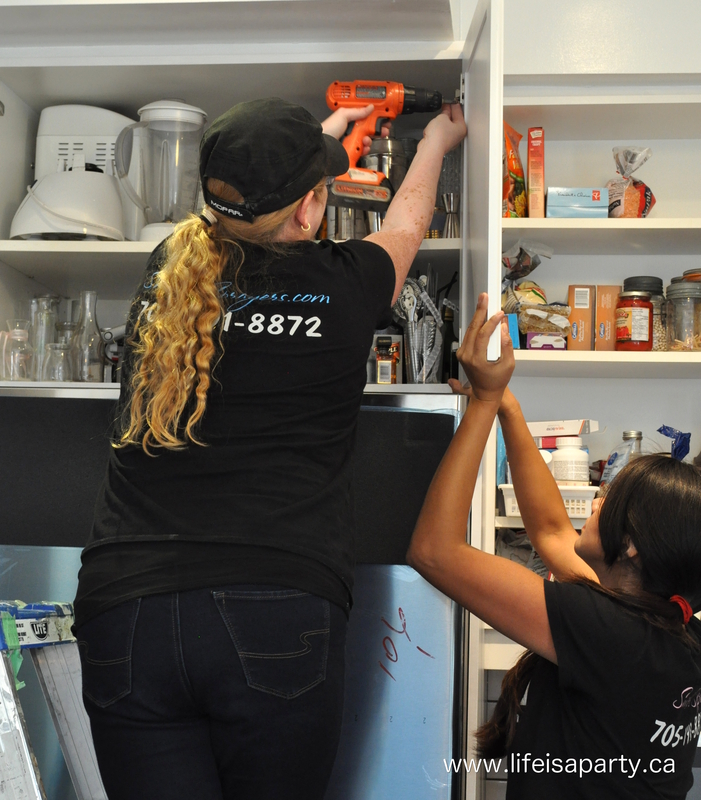 Cindy and her professional team of women treat your kitchen like it’s their own, and did a great job painting the cabinet bases on two more visits. On the fourth and final visit they did more work on the bases of the cabinets and reinstalled the cupboard doors and drawer fronts. They also installed the new hardware. Adding the brass pulls and knobs from Lee Valley Tools was like adding jewelry to the outfit. We love the warm antique brass accent they added, and Smith Sprayers did a great job installing them. I couldn’t be happier with the final result. I finally have the white kitchen of my dreams and I love it. What’s still on the to do list before we’re finished up? 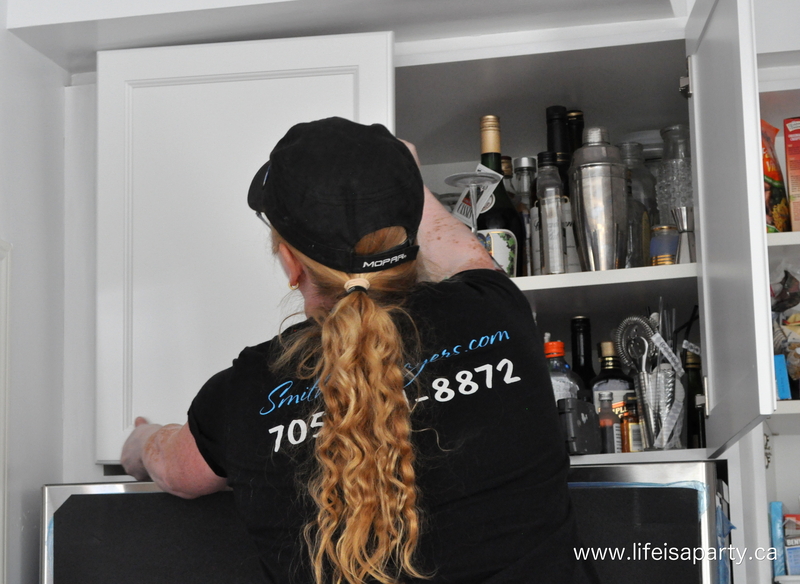 With new white kitchen cabinets, life really is a party! This is looking amazing! I can’t wait to see the finished space. Love the cabinets. Libbie, thanks so much. I can’t believe the difference the cabinets make too. oh that’s really the most effective and budget friendly way to give the kitchen a whole new look! bravo and yes LOVE the white kitchen! Wow, the cabinets look amazing! You would never guess they aren’t brand new. And the brass pulls are the perfect eye candy. 🙂 So excited to see the transformation as it unfolds! I love a white kitchen! The cabinets look so good! The cabinets look so good! It makes me want to paint mine! I am looking forward to the reveal! I always say It’s amazing what a bit of paint can do! They look great! What a huge difference the cabinets make in the space!! I want to paint ours, but my hubby is resisting 😉 Eventually I will get my way, lol!! I can’t wait to see the finished space! Thanks Tim, I appreciate your encouragement. Thanks so much. I love the warmth of the brass too. Susie, thanks so much. You’re so sweet and encouraging! Thanks Mary, I know right, I’ve wanted mine white for ages, so glad they finally are. Kim, you really should own a white paint company. 😉 Thanks for the encouragement. Thanks Jessica, I can’t believe the difference the cabinets made! Thanks Andrea, it’s coming together. On to the fun stuff this week, hooray! Those cabinets look gorgeous! 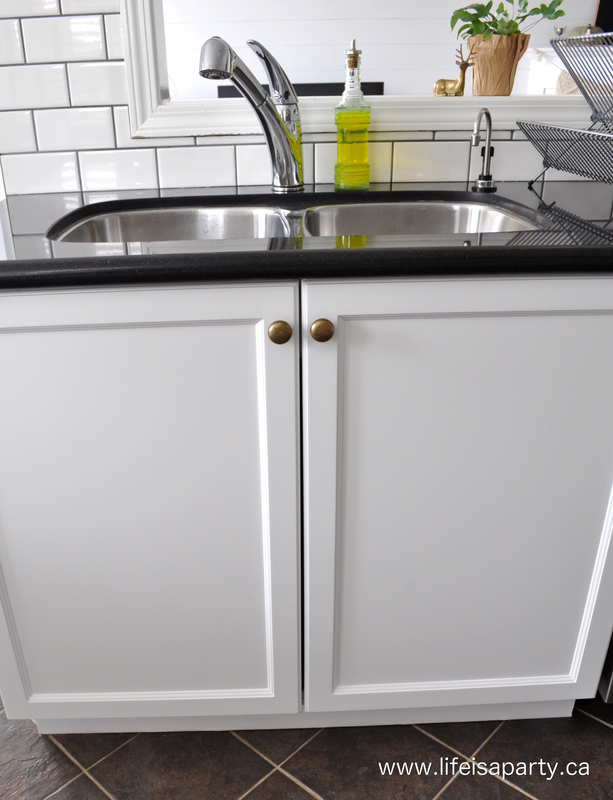 I dreamed of painting our old cabinets too…unfortunately we had to choke down the expense of replacing them. Looking forward to the next update and, of course, the reveal. It’s almost here! It’s all coming together beautifully! Can’t wait to see the reveal! Isn’t it mind blowing what painting cabinets will do to a kitchen!? Been there many times and I swear it makes the biggest impact. Love what’s going on with your space!! Thanks Leslie, yes I was lucky to be able to paint. Can’t wait to see your reveal too! Thanks Diane. It really is mind blowing, like a whole new kitchen. Finished to perfection! The cabinets look great! !